Happy to include you! Keep shining! Truly honored to be in this wonderful group! Thanks for your leadership and incredible spirit, Ananda! Thanks Ananda, always appreciate your support! So honored to be on this list with all these fabulous women. This is a great list! Love it and all of the great work you’re doing to showcase “Digital Sisterhood”. Keep up the good work Ananda! 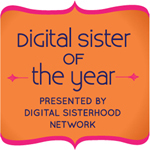 Congrats to the Digital Sistahood! Great list of women! I know several of their stories & excited to learn more. It’s such an honour to be featured as a member of this list, Ananda. Thank you for recognizing and supporting my work! Hi Lizetta. I love your goal. I affirm it. Wow, Amanda, thanks so very much!! Been a bit disconnected and not sure how I missed this. So honored and humbled to be one of your Empoweristas, thanks for including me on your list with so many others whom I’m proud to call my sisters! It was my pleasure. You do so much to build and engage the LATISM community and digital space in general. You inspire and amaze me. Keep shining!